The Providence Friars were able to upset #11 ranked Arizona 69-65 in the semifinals of the Wooden Legacy to advance to the Championship game against #3 Michigan State. With their top 3 scorers (Dunn, Bullock, and Bentil) all dealing with foul trouble throughout the game, the Friars were able to pull this one out behind a massive effort from Ben Bentil and a clutch performance from their superstar, Kris Dunn. I’m sure that every fan base thinks that the refs are trying to screw their team at one point or another but that doesn’t mean that it’s not happening. OK, maybe they weren’t doing it on purpose, but the refs sure were struggling during this one and it seemed to be mostly against the Friars. Take a look at this play and tell me you wouldn’t be flipping out…especially if that ended up being the difference in the game. Rodney Bulluck dunked it through Ryan Anderson’s skull and even though every single person watching the game can see that it went through the net and hit his head, the refs didn’t call a thing. Speaking of Arizona’s Ryan Anderson, he finished the game with 27 points and 12 rebounds. I don’t think I’ve ever seen numbers like that and been less impressed with a performance. He was getting every single call from the refs and played softer than cream cheese for the game but continued to puff out his chest after every play. You’re not making a deep tournament run with him as your best player and no second fiddle. Ben Bentil played a monster game. It can not be overstated how big he came up in this one. With Dunn out for most of the game with foul trouble, he really took this game on his shoulders. Him and Kyron Cartwright seem to have this thread the needle play down pat where Kyron rips a one handed bounce pass on a thread to the big man. Bentil is very good at rolling to the basket and the Friars guards are more than willing to find him at the hoop. 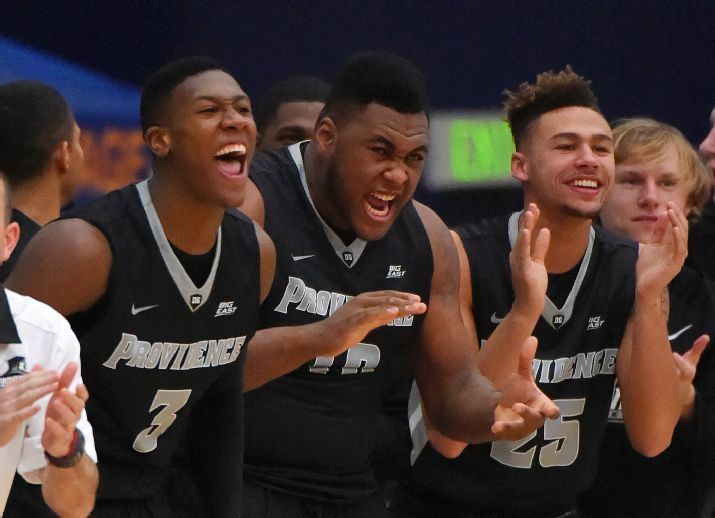 The Friars were a solid 50% from the floor, 33.3% from three, but only 58.8% from the line. We’ll be able string together good percentages to all three of these soon…I hope. Junior Lomomba continues to impress the hell out of me with how solid he’s been playing. His three’s may not look attractive but they’ve been effective, and I’ll take that every time. Rodney Bullock had a tough time getting into a rhythm in the game but hustle can always fix that. The Friars were able to keep it close until Dunn re-entered the game around the 5 minute mark. That’s when he took over the game. He was unstoppable down the stretch. That dude has NBA moves. In just 21 minutes, he was able to score 19 points and drop 8 assists. That’s crazy. And he was able to seal the game with this emphatic slam on a Ben Bentil steal. Next Up, the Friars take on #3 Michigan State at 10 PM Sunday Night, so I’ll continue to lose sleep for the Friars…but with games like Arizona, it’s worth it.